Saturday 24th November – Stitch on Saturday – the last one this year and a chance to catch up with other memebrs and get that stitched christmas gift finished ……. or at least an excuse to get out of the house! Remember to book your places on workshops for 2019. They get full very quickly but it’s worth being on the waiting list as there are lots of reasons for late cancellations. 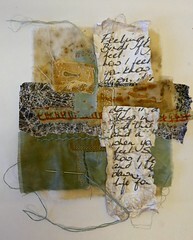 This entry was posted in exhibitions, textile art, what's on. Bookmark the permalink.